This is a video on how blogs build community created for the day school parents of Knoxville, TN, who are doing a training with The Jewish Ed Project’s Parent to Parent initiative. I was supposed to co-host a session with them, and had a last-minute conflict… :/ So, this is me "being there without being there." Hit me up with any questions! Hi everyone, it's great to connect with you all, and I’m so sorry I can’t make it. I’m really looking forward to next time when we can have a deeper conversation about social media, and really dig in with strategies and fun tips and all kinds of goodies. I love talking about blogging because it ties in so well with Jewish sensibilities about content and conversation. The Talmud was, arguably, the first blog – a conversation that takes place across time and space, bringing in many voices, contradictory opinions, and preserving it all. Even the format speaks to this. If you’ve ever looked at a page of Talmud (and not gotten completely intimidated, as I usually do), the main content is at the center, the comments in chronological order reverberating out from there. Folks comment on the main idea, then comment on the comments, then comment on the comments’ comments… Ah, Judaism, the ultimate obsessive-compulsive book club. While blogging was hot news online about ten years ago, it’s still, i believe, at the heart of the internet. Blogs are where the stories live and breathe and grow. Think of it this way. If the Internet is a city, then Facebook is a college campus, LinkedIn is a convention center, Twitter is a series of cocktail parties in little, connected clubs, Pinterest is a shopping mall and an art gallery (in many ways), and so on and so forth, but blogs are often the homes. Blogs are where authentic stories come out. And people can visit your house, and engage in your story there, and that’s amazing and valuable. But more and more, as social media has evolved, it’s when those stories are brought into all those other places – the shopping mall, the convention center, etc. – that they become part of the bigger conversation. Sharing the story in your home, but then opening it up to this larger audience help create a sense of fluidity, of comfort, of community. Stories get set free when they’re shared in these larger spaces and the conversation around them gets hosted there. And the best part is, often, those stories don’t stay online; they influence the way people interact with one another in real life, then flow back into the online world. So, blogs are a place for establishing a voice. For being your most authentic self, outside of proprietary social networks like Facebook and Twitter. But if you want people to join you in your home, to share in your story, you have to go out into the world and introduce yourself. Share that story. Ask questions. Visit other people’s homes and listen to what they have to say. Take this metaphor with you as you think about writing your blog post. And most of all, have fun! Please send me any questions you might have over email (or via Facebook, or Twitter, or LinkedIn…I’m all over the city), and I’ll see you next time! The Community Building Internship at jU Chicago is premised on the idea that small communities are, as sociologist Jonathan Woocher has written, “a consistent source of meaning, a focal point for relationships, and a powerful contributor to a sense of self-worth.” By empowering a cohort of students to create small communities organized around a theme, activity, or shared interest, we are able to create the kind of specialized Jewish opportunities that have the power to engage more Jewish students on a deeper, more meaningful level. To date, our nine interns have created small communities around everything from cooking elaborate Shabbat dinners once a month, to weekly student-run Jewish yoga and meditative practice, to reinvigorating the traditional idea of a tisch. The internship also draws heavily on network theory, as presented in the book Connected: The Surprising Power of Our Social Networks and How They Shape Our Lives by Nicholas Christakis and James Fowler. Christakis and Fowler argue that there are fundamental rules that govern the formation and operation of social networks, and that social networks must be tended to by individuals and organizations in order to function optimally. There is even a social structure which, they argue, can yield the best results in terms of human achievement: a series of loosely connected small communities, the members of which are more closely connected in discrete cliques, hubs or pods. By adopting this “pod” model in the Community Building Internship, our hope was to create a dynamic campus Jewish community from which Jewish innovations and achievements can and will arise. But how can we, and the student interns, know if the communities they are creating look anything like the structure recommended by Christakis and Fowler? Enter a roll of butcher paper, post-its and some colored Sharpies: all the ingredients needed for a low-tech version of network mapping. First, the interns decided who they considered to be part of the core membership of their communities, and wrote those names on individual post-its. Then, they arranged the post-its on the butcher paper so that their spatial placement was reflective of relationships between members–for example, if two people in the group were dating, or if they were close friends who came to meetings together, or roommates, then their post-its would be next to each other. Once we had determined the shape of the interns’ discrete small communities, we went about identifying the connections between people in different communities, and figuring out how to represent different relationships between people/post-its with different colored sharpies. By creating a physical representation of the network of Jewish students at UChicago, the student interns were able to identify the people at the center of the network, participating in multiple small communities, who were functioning as “hubs” of Jewish life and activity. They were also able to see the people who were less-connected to others within the network and who therefore had more potential for involvement and collaboration. We learned that our small community initiatives actually did resemble the structure recommended by Fowler and Christakis. Less practically but more important for purposes of morale and enthusiasm, the student interns were able to get a sense of how their smaller efforts were adding up to an impressive constellation of students involved in Jewish communities across social networks and different pockets of campus life. 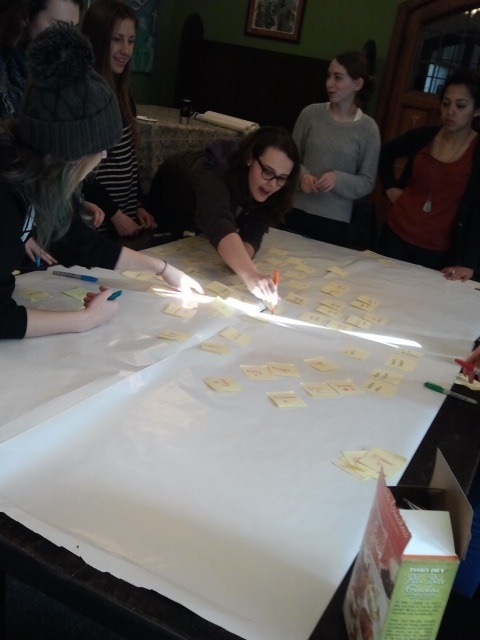 Lastly, the process of creating our network map was collaborative, iterative and fun. We plan to do it several more times throughout the length of the internship. Our prediction: as the people in our small communities forge connections with others in the overall network, these connections will create a density that will attract more and more students to the meaning, pleasure and fun of Jewish life at the University of Chicago. Rachel Cort is the Director of Community-Building programs at jU Chicago, an organization that works with Jewish students at the University of Chicago. She is currently pursuing her Master's in Jewish Professional Studies at the Spertus Institute for Jewish Learning and Leadership. An age old problem for Program Directors, is guessing what gets people in our building. But, here we are in 2012, and now the question has changed. The future of modern Reform Judaism is not figuring out how to get people through our doors, but figuring out how to get people connected to each other. As a Member Services Coordinator of a modern Reform Congregation, I am privileged to belong to the Program Directors of Reform Judaism. But I've learned from my colleagues that Program Directors have a variety of names and even a wider variety of duties. There are Community Coordinators, Directors of Family & Congregational life, Directors of Membership Engagement and Community Engagement Mangers. As we communicate with each other and share ideas and goals, one thing is clear: building our programs in the traditional, top down, guess what people want, throw ideas against the wall and see what sticks method is not working. This is an expensive and antiquated way to serve our congregants. While many of the benefits of a synagogue can be found elsewhere (especially online), there is one thing we can uniquely offer: Community, where our members find recognition, validation and support. This is the tripod by which our programming must be built upon. One might call it "engagement programming". So here at Congregation Beth Torah, we have begun to program using the lens of engagement. To start the transition, we looked at our caring committee. When you join Congregation Beth Torah, you are automatically part of our k’sharim (caring) Committee. Every single family unit is included. The entire congregational roster is divided by twelve. With approximately 650 families, this equals about 53 families per month. As a member of Beth Torah, you are part of a team for one month a year, and you are never alone. When there is a need in the congregation for a meal, or a ride, or attendance is needed to make a minyan at a shiva service, an email blast goes out to the 53 families on the team. Members of that month’s team contact each other, schedule with each other, and coordinate efforts with each other. Not only does this alleviate the problem of caring committee burn out by having the same people do everything, but our congregants in need get care and warmth from other members of the congregation AND the members of that month’s team form a functioning affinity group. By connecting members outside of our building doing k’sharim work, they have much stronger connections when they happen to be in our building at worship. They already know each other (recognition), know the other person has done a caring deed for one of our members (validation) and has been offered a meeting place, here in our building to further their relationship with this other person (support). The purpose of our K’sharim committee is, of course, to care for our congregants. But our caring community has an additional goal: to connect people. We are a visionary team carrying out the mission of the congregation. Through our dedicated team’s collaborative culture, we engage our various congregants and affinity groups to develop innovative ways to meet the needs of our congregational community. We will work, supported by the Board of Trustees, to accomplish these goals in the most creative, efficient and cost conscious means possible. The results of this change have been immediate and amazing. Some programs have been discontinued. Every program must have at least ten participants. It is not up to me to come up with ten people, but up to whomever owns the program. We did not have a men’s club as of three months ago. I had a couple of men approach me about some activities for such a group. My response was to come up with at least eight more men and some program ideas and then I would meet with them. I am proud to say that a group of nearly 30 men met on a recent Monday evening in a member’s home for some smoked brisket, some football and some beer. But mostly they met to be a community. Because more members are meeting more members, our worship numbers have risen. Our traffic in the building has actually increased with these groups and I love walking through our building and hearing a group of twelve people in a room discussing their interest in mystic Judaism next door to our 50 and More group planning their next book club meeting, next door to our Adult B’nei Mtizvah class. All the rooms contain more than ten people and all the rooms are starting places for new relationships. All the rooms are places where our members are recognized, validated and supported. We have just begun our journey. As Program Directors, or Engagement Managers, or Member Services Coordinators, we have the exciting and challenging task of recognizing the affinity groups that organically arise, validating these groups as important to our congregants and supporting these groups through resources and expertise. Laura Intfen is the Member Services Coordinator at Congregation Beth Torah in Overland Park, KS. You can find them on Facebook and Twitter. This post is part of a blog series on Connected Congregations being curated by Darim Online in partnership with UJA Federation of New York. Through this series, we are exploring what it means for synagogues to function as truly networked nonprofits. Connected Congregations focus on strengthening relationships, building community, and supporting self-organizing and organic leadership. They are flatter and more nimble, measure their effectiveness in new and more nuanced ways, allocate their resources differently, and use technology in a seamless and integrated way to support their mission and goals. We hope these posts will be the launching pad for important conversations in our community. Please comment on this post, and read and comment on others in the series to share your perspective, ideas, work and questions. Thanks to UJA Federation of New York for supporting this work. I’ve recently found that Twitter has been enhancing my experiences at conferences and conventions. I joined the social networking site when I was at the URJ Biennial in 2009, as so many people seemed to be tweeting there. As I got ready for the CCAR Convention it wasn’t just about finalizing travel arrangements and packing clothes, it was also about identifying the hashtag (#CCAR12) and downloading the convention app. And in the weeks preceding the convention Rabbis started tweeting about what they were looking forward to, they asked questions about what to bring and they shared travel arrangements. It is therefore hardly surprising that from the very beginning of the convention technology and social media have been playing a central part. A number of people were walking around the convention halls with QR codes stuck to their lapels (this was going to be one of the innovations being pushed at the CCAR). When scanned, these QR codes provided links to webpages, videos and information about the convention. And of course, from the very first session, Rabbis were tweeting about the convention. Services also took full advantage of technology as people were encouraged to lay down the siddur and pick up the iPad. With the CCAR’s iT’filah app, the congregation was divided with people following the prayers on the screen and on the page. And in some services you didn’t need an iPad, you didn’t even need a book, as the prayers were broadcast onto screens at the front of the room for everyone to follow. Visual t’filah meant that hands were free, heads were looking up, and our bodies were opened up to join together in prayer. And again Rabbis were tweeting. And in sessions, they demonstrated good practice; a few copies of Rabbi Arthur Green’s handout were distributed, but on the screens a link was given for people to download the handout, along with a QR code for the handout, and during the session, all Jewish texts were displayed on the two large screens on either side of the podium. And of course, Rabbis were tweeting. For me it was great to simply meet the people I know from Twitter, live and in person (I just had to learn names in place of handles). Many of these social media Rabbis were also a part of The Tech Bar, where colleagues could come for advice and conversations about how to use the technology. When reflecting on the technology used at the CCAR convention, I am convinced that thousands of trees were saved as a result of this focus. I have several ideas I’ve seen here which I will be taking back with me; for one I’ll be adding QR codes to my business cards (thank you @rabbiadam). And the tweeting added so much to my convention experience. In sessions a conversation could take place in the background, with key quotes shared with colleagues on Twitter. And during the breakout sessions, I followed the session I was in, but I could also get a taste and flavor of the sessions I could not attend. I would love to hear what other people took away from the CCAR convention (whether they were there or following on twitter). But I am left with one final question: what happens to a hashtag (#CCAR12) when the convention is over? Danny Burkeman is a Rabbi at The Community Synagogue (www.commsyn.org) in Port Washington. He has been playing with computers since he first got an Amstrad 128K (an old English computer). Technology has been an important part of his rabbinate, and today he blogs (www.rabbidanny.com), tweets (@rabbi_danny), is on Facebook (R Danny Burkeman) and is now podcasting on iTunes (Two Minutes of Torah). To learn more about QR codes, you’re welcome to replay Darim’s webinar with guest QR expert, founder of The QR Project, and HUC Rabbinical student David Gerber. Click here to play the webinar. Training: Organizations, their leadership, and their professionals well-positioned to build and sustain networks should gain a greater understanding of how networks operate and how to work in a networked way. This training will be most effective if it includes a continuum of learning the theory and practicing it in action. Professionalizing: These steps and others will build toward the professionalization of the field of Jewish network-weaving – which will create a commonly accepted terminology of network-weaving, its challenges and benefits. With this understanding, it will become more standard for organizations to incorporate network-weaving into their job descriptions and their strategy. The fact is that professionals across the spectrum of Jewish nonprofits are already weaving networks – that is, connecting people with resources and each other for greater goals. Communications and alumni relations professionals and those in outreach, education, and young adult engagement are just some examples. In my interviews, I have observed many common themes amongst those who excel at network-weaving positions. These include a desire to get to know others due to an insatiable curiosity for and fundamental love of people; a knack for retaining knowledge about others so as to formulate helpful connections between disparate parties on the spot; and an ability to employ these talents and others for the sake of driving forward projects, and ultimately missions. Yet while many of the network-weavers I interviewed spoke of the innate and intuitive “people skills” their work entails, there are tools, technologies, as well as theory and strategy behind building networks, which have a firm academic foundation that can be learned and applied. Furthermore, I believe that network-weaving throughout the Jewish world will become increasingly effective as network-weavers learn to practice a greater degree of intentionality – a consciousness first and foremost of the larger vision they are seeking to achieve, and then an understanding of how networks operate and how they can be strategically leveraged toward those goals. The process of training, connecting, and professionalizing that I have laid out will help those who are currently in network-weaving roles to become more effective – as well as those who are naturally adept at network-weaving characteristics (such as relationship-building) and would like to fill professional network-weaving roles to grow into them. This, therefore, would also tremendously benefit the organizations network-weaving positions are housed in, and the Jewish world as a whole. Considering that so many organizations and individuals are currently exploring the path of building networks, I believe it only makes sense to find ways to weave our efforts together. Network-weaving sounds highly theoretical until you try to put it into practice. At the point when talk begins to translate into action, everyone will need to support one another through the challenges and combine our energies and resources toward the solutions. What do you think needs to happen in order for this field to be professionalized? What do you need in your organization and/or as a network-weaver? How have you created organizational change, and what do you dream of for the future? If you would like to be a part of these efforts, please contact me! Deborah Fishman is a network weaver interested in new opportunities to create change in the Jewish world. She was most recently Editor and Publisher of PresenTense Magazine. This post is cross-posted on Deborah’s blog, hachavaya.blogspot.com, as a part of her ongoing conversation series with network-weavers about their best practices. Deborah has published many of these interviews and other network weaving thoughts on eJewishPhilanthropy.com too. There is a great deal of buzz about the use of networks in moving the Jewish community forward. It tends to rely a great deal of some of the big name thinkers from the general world in areas such as networks, and some “first cousin” concepts and practices, such as Communities of Practice, Professional Learning Communities and the like. The Sages of ancient (and modern) times communicated and innovated using many of the practices that are at the core of networks today. Unlike today’s networks, the Jewish networks that built a new Jewish life in the Talmudic Era and beyond, included communication between people who literally could never have spoken to one another: the network extended beyond distance and, incredibly, beyond time restrictions. Rabbis were “talking to” rabbis who were long deceased. It took me over 30 years to understand that what he was telling me was: The rabbis and scholars who came before us are very much a part of our network, in every sense of the word. Here’s an example of how it works, a social network representation of a page from the Babylonian Talmud. The text of Talmud Shabbat 21 a-b takes a conversation about the wicks and fuels that can be used for Shabbat lights and moves from there to a conversation about the lights used for Chanukah. The Talmudic text begins with Rav Huna, who is right in the middle of the graphic above. He is in the middle of the Talmudic period, and lived in Sura, Babylonia. In the text, Rav Huna, the Chachamim (rabbis who lived long before his time), Rava, Rav Hisda, Rav Zeira, Rav Matna, Rav, Rav Yirmiah, “The Rabbis”, Abaye, Rabin, Rav Yochanan, Rabbah bar bar Hama all enter the conversation. What then follows is the famous disagreement between the followers of Hillel and the followers of Shammai as to whether a pious person begins the holiday of Chanukah lighting one light and increasing to eight, or beginning with eight and decreasing to one. This leads to interaction with two later sages, Rav Yosi bar Avin and Rav Yosi ben Zevida. and to Rabbah bar bar Hama mentioning two unnamed characters, each of who backs either Hillel or Shammai. This “discussion” takes place (without benefit of phone or Internet) across great geographic distances, in Babylonia and in the land of Israel. It also occurs across several centuries. One interesting caveat: The rationale attributed to Shammai’s opinion about the Chanukah lights brings a relationship between the holidays of Sukkot and Chanukah into play. The origins of Chanukah in the holiday of Sukkot dates back to the apocryphal books of the Maccabees. While these books are not directly quoted, Shammai (and those who explain his views) clearly have an intellectual connection to those books, which I show in the graphic. In the diagram above, the conversation continues (and it mentioned on the Talmudic page in the margins) with later codifiers of Jewish practice – Maimonides, Rabbi Jacob and the two authors of the Shulchan Aruch code of law – entering the conversation by codifying the current practice (putting them in “direct” conversation with Hillel, who lived over a millennium before). As Jews, we are networked. It is part of our heritage. In bringing the use of networks to build and spread ideas, what we need to do is to re-educate the Jews of today to join the networked Jewish conversation that has existed since the dawn of the Jewish people. This isn’t about taking a new idea and translating it to the Jewish world. It is about taking an ancient habit of mind, teaching it to this generation of Jews, and giving it new life. Rabbi Arnold D. Samlan is Founder and President of Jewish Connectivity, a Jewish Life Coaching and Consulting practice. He is also a staff member of the New Center for Collaborative Leadership at The Jewish Education Project. Arnie is on Twitter @JewishConnectiv, and his blog is at the notorious r.a.v. A relative, 10 years after beginning his Ph.D. thesis, still hadnt finished. Couldnt get it just right. Knew it would be scrutinized. Wanted to make it right; didnt want to be caught in imprecision, or worse yet, error. 10 years. Not finished. Two years ago I had a similar problem. Trained as a lawyer, being a publisher and editor, I live in a world of words. Theyre important; theyre permanent. I am accountable for what I write, and for what my company publishes. Words will endure. They need to stand on their own, be thorough, be accurate, be complete. But Behrman House needed a blog, and as the leader of our firm I needed to contribute. To share my views in that informal setting. So write I did, but I did it in my old way: I wrote, edited got it vetted by colleagues, checked, rechecked, sometimes rewritten. A short piece, with a quick thought, could take hours. It just wasnt worth it. I thought back to my college days, where I wrote a weekly column for the paper. I just banged it out. Every week, one evening. Went the whole campus. It was pretty good. And I had no fear. So I made a decision: Ill trust myself: write the damn thing, read it once, fix obvious errors, and post it. Simple as that. So I tried it. Truth be told, the first time I chickened out. Sent it to Dena Neusner, our Senior Editor, who can tear apart and rebuild my writing like no one else, and makes it 30% shorter on a regular basis. She did her magic, and I decided I was done. Posted it. And, next time I didnt even send it to Dena. Im writing this to all of you who grew up in my world, the world of permanent words, the world where every one of those words is equally important, and permanent. And to all of us I say: Just write the damn thing, and post it. It will be liberating. Think of it as conversation, not a permanent position. (Lisa Colton spoke at the GA of the permanent beta, and shes right.) It will never be worth it to spend a half-day on a blog post, so if thats your standard, youre censoring yourselfit will almost never be worth it to spend the time, and so youll never be able to share your views. PS: I wrote this one on the airplane coming home from the GA. Once, straight througha half-hour. Put it aside for a day, then spent another 10 minutes cleaning it up. Im done. I hope its good, and I hope you find it useful. If not, maybe Ill be more successful with the next one. David Behrman is CEO of Behrman House Publishers, the leading publisher of textbooks, software, and other educational materials for Jewish religious schools throughout North America. Before joining Behrman House, he was a consultant with McKinsey & Co, in New York, where he served clients in the service, transportation, and not-for-profit sectors, and he also practiced corporate and securities law with Davis Polk & Wardwell in New York. He is a graduate of Haverford College and Stanford Law School, where he served on the Law Review. What Have We Learned This Week? This Year? Posted on October 3, 2011 by Author Lisa Colton Leave a comment on What Have We Learned This Week? This Year? When I joined Facebook, the first updates I began to post daily balanced my work and my play. They bounced between humorous (most often) and serious. Some reflected my rabbinic side; some addressed my musical (and scratch DJ) side; many dealt with pop music or pop culture. After a few months, I figured out that social media is not about listening to myself, it’s about bringing people together to share. Beyond their individual reflections, the participants in this weekly ritual have begun to talk to each other, supporting (or challenging, such as the discussion on the difference between “fact” and “truth”) friends and sometimes strangers as we close our week together. My Friday Facebook wall has become a safe place for introspection, joking, kvetching, and praying. We judge our own learnings from social media and from the rest of our life and, without judging one another we get the opportunity to learn from each other’s weekly journeys. And in the end, it’s the sharing of one another’s journeys that is what life, as well as social media, is about. Judaism has a practice in which a person conducts a cheshbon ha-nefesh, a self-audit of one’s soul. Some people engage in this practice daily, others less often. During the Rosh Hashana season, it’s particularly apropos, as we look back on the year past and at the year ahead. We assess ourselves honestly, and we set our course for the future. Why not invite my Facebook friends to share their own cheshbon hanefesh on my Facebook wall? May we all continue to learn and share, and may be all be blessed wish a shana tova u’metukah, a happy and sweet New Year. So… What you have you learned this year? Share your thoughts in the comments. Arnie Samlan is a rabbi, Jewish educator, consultant, Jewish life coach, and aspiring DJ. Follow him on Twitter (@JewishConnectiv) and his blog The Notorious R.A.V. Arnie is part of the professional team of the New Center for Collaboration and Leadership of The Jewish Education Project. Thanks to the 70 people who came out this morning to learn, share, problem solve and mature the Jewish community’s use of technology, new models of leadership and creative thinking. Due to the overloaded wifi network (a problem when you bring 2000 techo-philes into one hotel network), the live evaluation and feedbacks were slow to post today. Thus, I’ve embedded them here, both for the participants and others who may be interested. We used Poll Everywhere to enable everyone to text in their questions and see what others were thinking. You can also find the slides and other related links below. Thanks to everyone for coming, sharing and leading. We invite additional comments, reflections, ideas and requests in the comments here. We’ll also be following up with the resources discussed in Rachel’s problem solving session, and emailing updated info, links, roster, etc. to all. Today the Jewish New Media Innovation Fund announced the winners of the exciting process that help catalyze our community to focus on new media, our missions, and our strategy for the digital age. It was a fascinating experience to read the applications of the final 30, think deeply about the criteria of the fund, collaborate with an extraordinary team of advisors, and work with three visionary foundations. I am honored to have been part of this pilot year, and I hope that this initiative, and others like it, will continue. While I’m quite excited about the projects that have been awarded funding, I’m even more excited about the broader impact that this fund has had on established organizations, entrepreneurs, and funders alike. Having worked to advance the Jewish community’s use of digital media for over 10 years now (wow, that went fast), I can see that even the announcement of the Fund changed the conversations among staff and lay leaders throughout the Jewish community. While a social media and mobile strategy might have been pushed to the bottom of the agenda over and over again, the Jewish New Media Innovation Fund forced them to put it at the top of the agenda, and to think about it strategically, not just tactically. Regardless of whether or not these ideas were funded today, providing an incentive, structure and time line I’m sure has deepened and advanced the work of many applicants. It’s also important to note that the criteria used to evaluate the proposals has an impact beyond the short term decision making about fund allocation. For example, one requirement was that the projects would be able to launch or achieve results within 12 months. While in some cases this felt like a really compressed time line, the reality is that we are all in a permanent beta mode — we have to throw ideas against the wall, assess their effectiveness, and continue to refine over time. If you’re spending more than a year putting it together, either the idea wasn’t sufficiently thought out to begin with, or you’re not prepared to develop in an agile and iterative process. The fund also set a priority on innovation – though the term was fairly broadly defined. In many cases, I think the made applicants really think beyond the obvious. I was impressed by how many applications viewed their mission through a new lens as they developed their applications. While the technology employed may not have been so “innovative” and new, the ways that they were thinking about their work clearly were. Kol hakavod to those that busted through the walls of their buildings, put the freedom of exploration in the hands of their users, and researched technologies, platforms and models outside of their immediate sphere of influence, or even their comfort zones. There are many more lessons to be learned from the applicant pool, process, and over time, the outcomes of the projects funded. Regardless of who receives a check, this Fund was a tremendous gift to our community. I hope that those who used the opportunity to think in new and deeper and riskier ways will still find inspiration and value from the process, and will resolve to continue to take action on these ideas by incorporating these costs into their operating budget where appropriate, writing other grants, and seeking the support of other funders – foundations and individuals – who also recognize that these tools, ideas and approaches are critical to our communal future. Are you an applicant to the #JNMIF who didn’t get your project funded this round? How are you going to proceed with this work? What non-financial assistance do you need? Leave your thoughts in the comments.